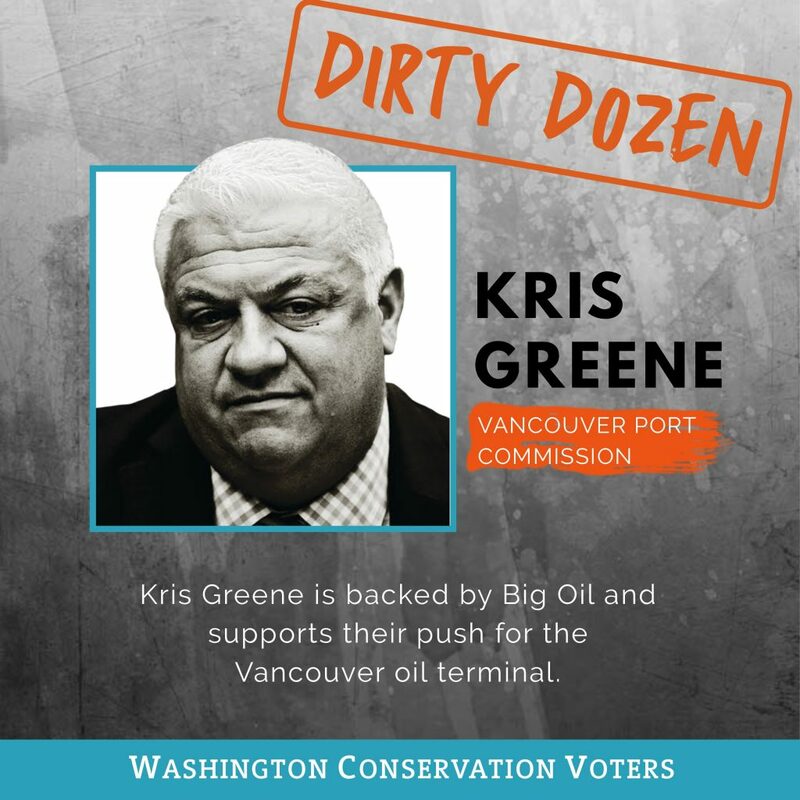 Vancouver, WA October 9th 2017 — As a key part of its electoral work this year, Washington Conservation Voters announced today that Kris Greene, candidate for the Port of Vancouver Commission, is being named to the “2017/2018 Dirty Dozen in the States.” Modeled after the League of Conservation Voters’ trademark federal “Dirty Dozen,” the state version highlights twelve of the most anti-environment state-level candidates who state LCVs are working to defeat around the country. Last year, WCV placed Steve McLaughlin, candidate for Washington’s Public Lands Commissioner on the Dirty Dozen in the States list for his ties to the anti-public lands movement and donations from industries he’d be tasked with regulating. He lost to WCV endorsed candidate and current Public Lands Commissioner Hilary Franz. Twenty-nine state Conservation Voter partners are working to determine this election cycle’s “Dirty Dozen in the States.” The candidates named are some of the most anti-environment politicians running in competitive state-level races for governor, state senate and house or municipal seats this cycle. The “Dirty Dozen in the States” is modeled after LCV’s “Dirty Dozen,” which has targeted candidates for federal office (with occasional exceptions)— regardless of party affiliation — who consistently side against the environment, and are running in races in which LCV has a serious chance to affect the outcome. LCV has named candidates to the Dirty Dozen for more than twenty years. Last cycle, state LCVs defeated nine of the twelve “Dirty Dozen in the States” candidates. Washington Conservation Voters is the statewide political voice for the environment. We work to elect environmentally-responsible candidates to state and local offices. Working with our allies in the community, we advocate for strong environmental policies and hold our elected officials accountable both during and after the legislative session. Through our political work we strengthen laws that safeguard the health of our communities, preserve the beauty of our state, and protect our economic future. To learn more, visit wcvoters.org.